You can take a look at the cut out in the back, here, aren't they fun? Here is a side picture of the arm cutouts. Then one more photo a bit closer. I used a black thread in my coverstitch machine to finish the bands on this Neptune tee. I really took my time stitching and concentrated on my presser foot marks to keep the stitching straight. Our weather here has been crazy. Warm with temperatures in the 60's and then cools off to the 40's, which still is very mild for us. I really needed some layering tops that still look great when I take off my cardigan. The Neptune tee was a perfect choice. I did have a bit of stretching with the front v-neck when attaching the neckband. When you attach the neckband, there is nothing to sew the band to in that "v" area. While I was helping hubby on the farm, yesterday, I was thinking of a solution to make all the cutouts to lay better and not have the stretching. Stretching might not be the best word, the top of the cut-outs just need help with the alignment and to keep them flat. My conceived solution was Solvy Stabilizer. 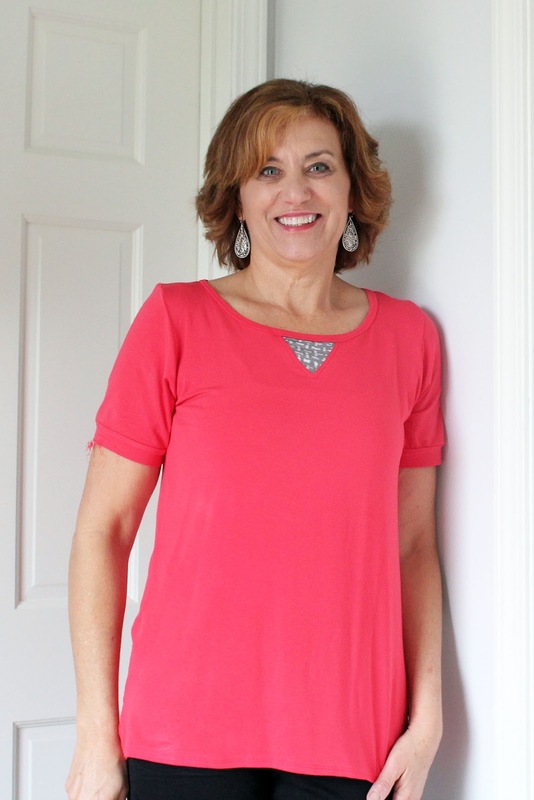 The pattern includes a v-neck insert and I thought cut the Solvy from that pattern, baste in the cutout, stitch your neckband, remove the basting and then pull out the Solvy. What is left will dissolve with water. What you do think? I am anxious to try this and see if I can improve my cutouts. 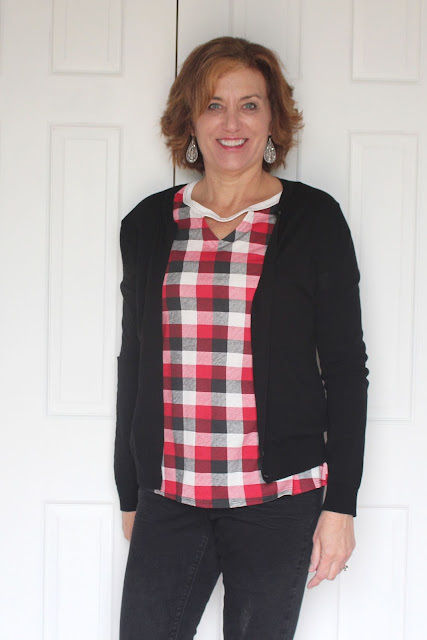 You can see in the photo with the cardigan, I didn't get the sides of the cutout quite even on the neckband. 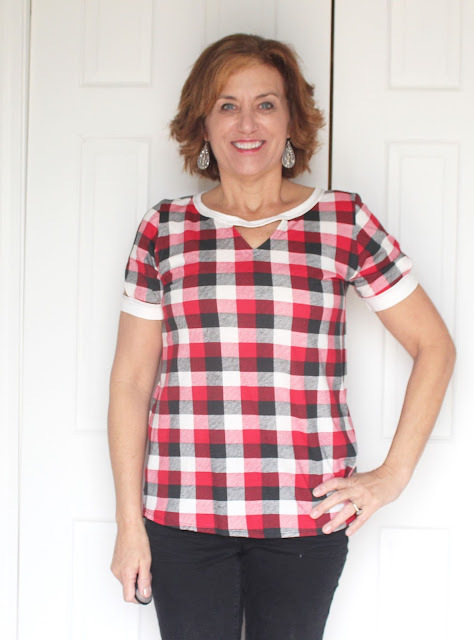 I was so busy concentrating on getting the deep v perfect on the plaid, I didn't even think about the top of the cutout even on both sides of the "v". Honestly, if the fabric wasn't plaid you wouldn't notice it. This Neptune with all the cutouts took me just over 1-1/2 hours to construct. After the cutout version, I wanted to try out the inset version for another option. 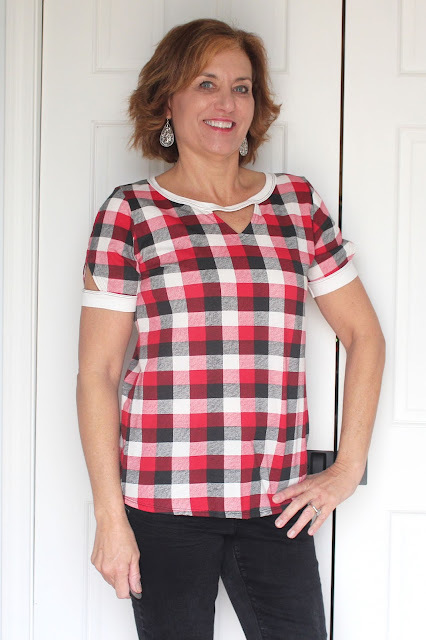 I had this great rayon lycra jersey from IndieSew, yes they sell patterns and fabric, too. You do have to act quickly to get their fabric, it sells so fast. The cutout is from some yardage in my stash and I felt the gray was a perfect compliment to the salmon color. 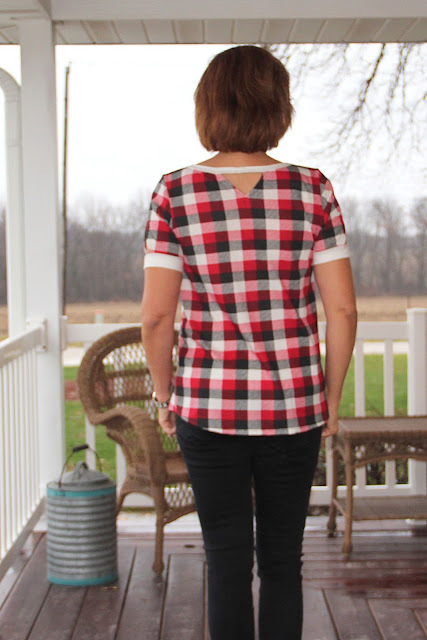 This shirt was so quick to sew with only one cutout, I think it took just over an hours. Here is close-up of the inset, which would look great on every cutout, too. The weather was not cooperative the last two days for photos. I took a few on the front porch over the weekend but the rain and darkness didn't lend itself to great photos. It was still raining today and I did finally find a place in my house to take some good indoor photos. Yea! This will be such a nice option during the bitter cold winter temperatures. So if you want a fun new tee pattern, take a look at the Neptune, it will work year round in your wardrobe. 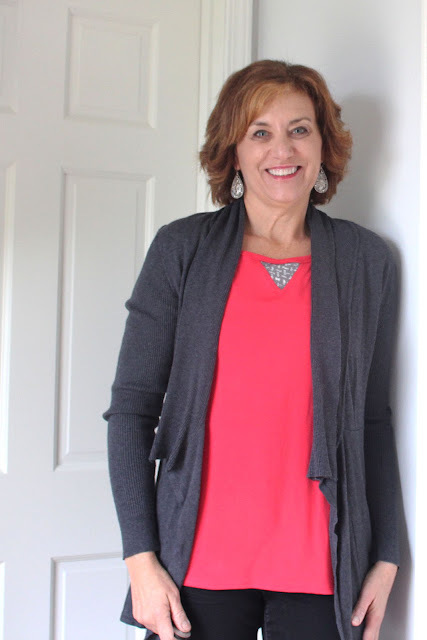 This cardigan was part of the reason I went with the gray inset and the salmon lycra really brightens up the gray cardigan. 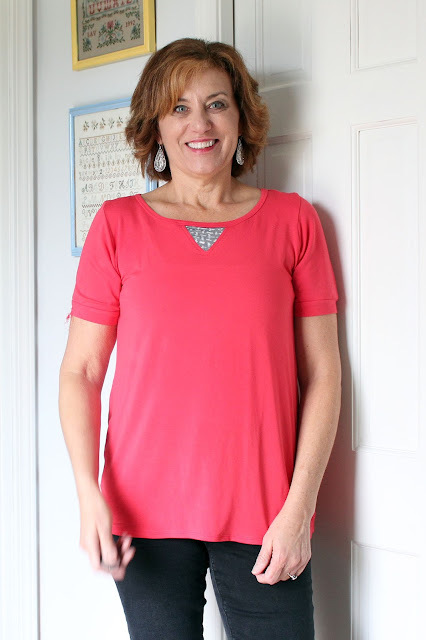 Disclosure - I was provided the pattern as a part of the Indiesew blogger team but the opinions are all mine. The fabric from Indiesew was purchased by me. Cute pattern I really like the coral with the grey inset! 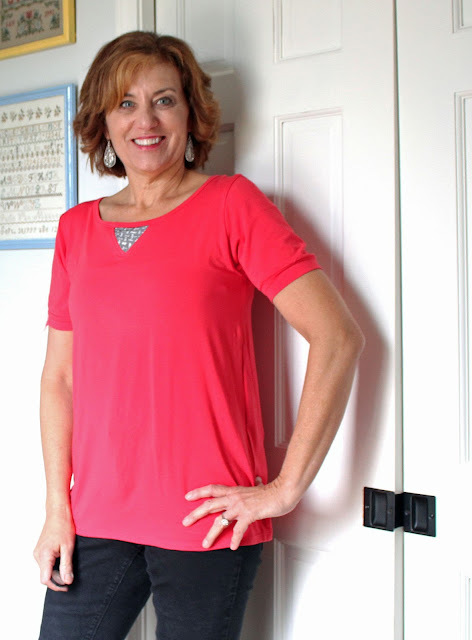 Thanks, Joen, I am wearing the coral one today! Both versions are great ! Lovely feature. I think the inset is particularly successful for a plain top it really lifts it. 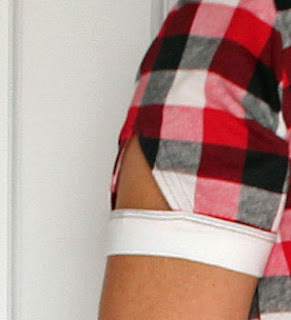 cute, I love t-shirts that have a little details that takes them from plain to interesting. Cute tops! I really like the salmon with gray inset and does work well with the gray cardigan. Thanks, Linda, I am wearing the gray with the salmon today. Cute tops! I love the salmon on you! What pattern did you use for the grey cardigan? The grey cardigan is White House Black Market from last year. You can find some good things on the sale rack in there sometimes.